For Catholics, the Sacrament of Baptism is the first step in a lifelong journey of commitment and discipleship. At Baptism we receive and celebrate God’s free gift of grace and salvation through Jesus Christ. In Baptism we are reminded that God has chosen us to live and grow with God’s people. As the first sacrament of initiation (Eucharist and Confirmation follow), Baptism is also the sign of a life long relationship with God and with the Church. The Catholic community welcomes all to Baptism with open arms and extends its love and support in living a life that reflects Jesus Christ to the world. Baptisms are celebrated every 1st and 3rd Sunday of the month at 12:30 pm. Please contact the parish office at (952) 469-4331 to register for Baptism and sign up for Parent Formation Classes. "The stained glass window over the main isle entrance leading into the Sanctuary expresses the theme of Baptism. Baptism, the Holy Sacrament, is represented by the Holy Spirit in the form of a dove. The Spirit – Dove is set into circle of yellow golden light color. Symbolically the circle speaks of oneness with God. At the top a half-circle descents. In it are shapes of clouds in blue color representing the heaven, God’s place. This half circle is repeated two more times as it descents downward embracing the golden circle with Holy Spirit. Out of this heavenly form water appears to flow downward. Seven yellow/gold water drop forms appear. They do symbolically represent the seven gifts of spirit. They are: Blessing, Glory, Wisdom, Thanksgiving, Honor, Power and Might. 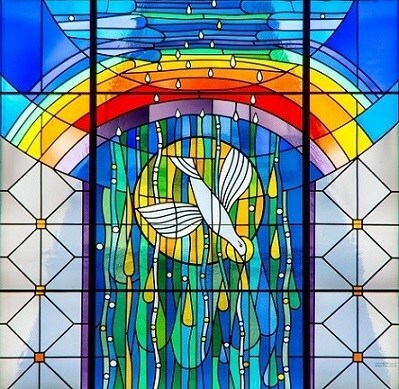 Above the Holy Spirit are the seven colors of the rainbow – representing God’s covenant with all people or a sign of Hope and Life as we see in Noah. The Main entrance isle is flanked on either side with Romanesque arches – the arch of the rainbow in the window repeats this architectural feature. It integrates the stained glass window nicely into the wall and creates subtlety a continuation of this beautiful architectural feature. Looking at the window from the altar one can see that it guides the eye to the Baptism font below in the Gathering Space."